Sputnik Arabic was able to talk to a Syrian expert on the armed groups in Syria, Husma Shaib, who explained why the so-called Syrian Democratic Forces (SDF) operating in Syria are comparable to the al-Nusra Front and what the actual aim of their operations in Syria is. "In Syria, we regard these forces as unlawful military formations which operate outside of the legal environment. They are the same a terrorist units like al-Nusra Front and Daesh. 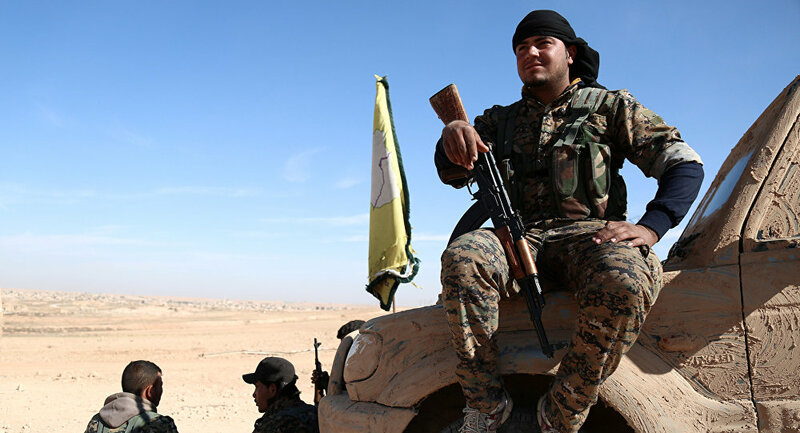 The Syrian Democratic Forces do not coordinate their activities with the Syrian Army. We regard them as terrorists," Husma Shaib told Sputnik. "According to the plot of the US, these forces should assist in the implementation of their plan on the setup of the so-called safe of buffer territories, which should cut Syria off from its neighbors," he elaborated. The expert, however, said that he hopes that with the help of Russia and Iran, the Syrian Army will be able to block these efforts. Meanwhile, he said, the SDF have been coordinating their assault on the Syrian city of Raqqa with both the US and Daesh. The SDF is mostly comprised of the Kurdish YPG militia which unanimously declared the “federalization” of what they call “Rojava”, or so-called Western Kurdistan, back in March 2016. In its turn, the Syrian Arab Army, the land force branch of the Syrian Armed Forces, is fighting to keep the existing territory of the country intact. Once the war on the Syrian soil is over, a nationwide referendum will be held to decide on country’s new constitution and administrative future. Technically, the Kurds, backed by the US and allies, and Damascus, backed by Russia and Iran, aren’t at war with one another. On several occasions, the official Syrian government forces and the Kurdish fighters cooperated. However, the two sides' hold contradictory visions for the country's future, which could become an issue.